Clew Bay Martine Services primary work vessel is Multimac, a custom built work platform that is unique in that it enables staff to safely manoeuvre and work in quite shallow waters and retrieve or move buoys as channels shift over time. 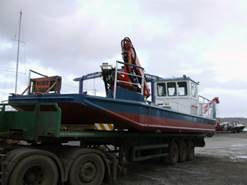 She was built by Mooney Boats, Killybegs, Co Donegal to Lloyds SSC rules. The Marine Survey Office along with Marine Design International inclined the vessel and a stability book was approved and she has obtained her P2 Passenger license. She has a top speed of 21 knots based on her sea trials. Multimac is fitted with a Guerra Marine Crane Model M40.90A1 with a GDW-050 winch. These are powered by a 20Hp engine driven Hydraulic power pack. Multimac was also specifically designed to be easily transportable. Because of this it is possible for CBMS to offer their services nationwide at relatively short notice.